I created this site with the authorsguild.net website building software and basic HTML to tweak the font colors, typeface and sizes. As a novice web builder, I welcome your feedback via e-mail. Elizabeth (Liz) Armstrong Hall writes nonfiction stories and books for kids and grownups. Her articles and essays have appeared in American History, Hemispheres, St. Louis Magazine, Pennsylvania Heritage, Christian Science Monitor, Boston Globe, St. Louis Post-Dispatch and Cornwall Today.Liz's articles for kids on history, archeology, art and animals have been published by Cobblestone, AppleSeeds, DIG, Highlights for Children, Spider and National Geographic Kids. Her stories on the wacky sides of life have appeared in the popular book series, Uncle John's Bathroom Reader for Kids Only. Since 2007, Liz has tutored kids as a "writing coach" on both sides of the Atlantic. She is a member of the Society of Children's Book Writers and Illustrators, the Authors' Guild and the Thames Valley Writers' Circle (U.K.). Liz is an alumna of six Highlights Foundation Workshops: "Mixing Research With Imagination," "Nonfiction Storytelling," "Finding Your Voice," Creating Setting," "Writing Biographies," and "Picture Book Boot Camp." She swims with the Freedom Aquatic Club (US Masters) team. A certified swimming instructor, she teaches adults how to swim. A native of Allentown, Pennsylvania, Liz lives in Prince William County, Virginia with her husband, Ray. 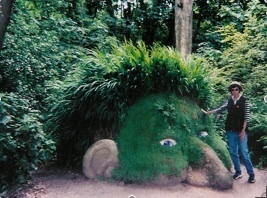 The Giant's Head mud sculpture at the Lost Gardens of Helligan in Cornwall, U.K. was Liz's inspiration for "The Giant in the Forest" (Highlights for Children, September 2009).